An Obama Presidency: Sweet, Sweet, Sweet! However, she could celebrate Barack Obama and feed weary Obama volunteers on election day, if she delivered her cupcakes to the local Obama campaign headquarters. 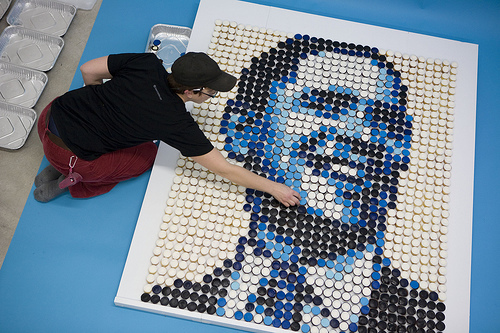 Working in Photoshop, Zilly broke Obama’s portrait into pixels of color she could then recreate in the form of “Italian meringue buttercream and handmade fondant.” Think of the buttercream icing colors as so many Pantone inks. The cupcakes were baked, iced and taken to local designer Shasti O’Leary Soudant‘s studio to be assembled and documented. Friends Mo McKenna and Alex Davies helped with the project. It should be noted that volunteers could not eat cake until the local media took its piece. Even cupcake-eating is a mediated practice these days.